Wood is a beautiful and timeless material that we all love for it’s warmth and charm. It can create a myriad of styles from refreshing, light and modern to deep, romantic and rich. Our client wanted to use the traditional qualities of wood combined with the modern look of brushed steel and white surfaces. The result is a beautiful and very individual kitchen. We like their style! Wood is a material that our designers and installers love working with. Whether you are looking for a Scandinavian style kitchen or a traditional oak shaker kitchen, we’d like to work with you to design your dream kitchen. All our designers are trained to use the latest 3D visualisation software so you can be 100% confident in how your kitchen will look. 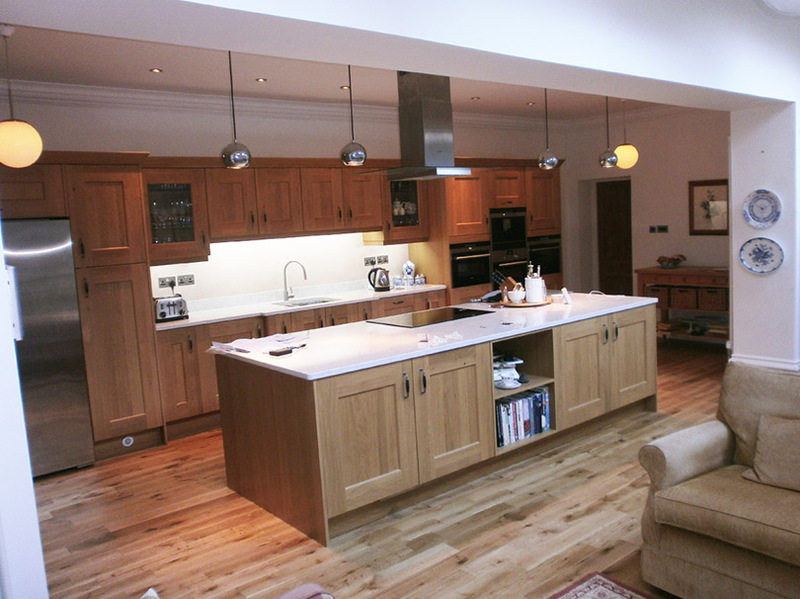 We will design, manufacture and install your kitchen. I really enjoyed working with fk&b. They just got it straight away. The style and look that I wanted. I was impressed with everything from the friendliness of designers to the quality of the units and speed of installation. A great experience and therefore a huge thanks to Emrys and the team. Next ArticleGloss, gloss, gloss… exactly what we wanted!